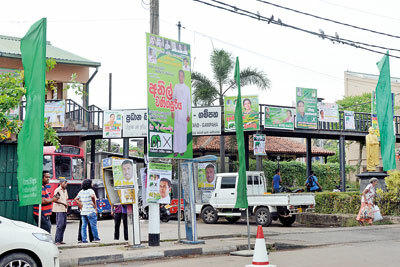 As campaigning for the 2018 local government elections enters the final stretch, excitement is building in the Gampaha District where major campaign rallies are being held during these final two weeks. The highest number of eligible voters in the country live here, with 1,724,309 persons registered to vote, according to the 2017 electoral register. Two municipal councils (MSC), five urban councils (UCs) and 12 pradeshiya sabhas (PS) make up the Gampaha District’s 19 local government bodies to which representatives will be elected. Voters, for the most part, insist that political parties don’t matter as much as the candidates themselves. The district was hit hard by drought last year and scarcity of drinking water is still a major issue. Other problems include garbage collection and repairs to infrastructure. In Oruthota, which comes under the Gampaha PS, vegetable vendors P.G. Bandula, 61, and Jagath Kumara Vithana, 52, expressed frustration that while pipelines meant to provide drinking water had been laid in the area in 2014 they were yet to be connected. “This is extremely hard for everyone as the wells are starting to dry up quickly during dry seasons,” Mr. Bandula elaborated. Drinking water had to be distributed through bowsers during the most recent drought. Other basic services have suffered. “None of those are working,” Mr. Vithana stressed, pointing to street lamps on the road next to his shop. Devika Subhashini, 36, first started working for the UNP while still in school and had also manned the phones at a campaign office of the then common candidate, Maithripala Sirisena. With no permanent job, she runs a small tuckshop with her mother, Rathnaseeli Perera. “The authorities keep telling us to move, saying our shop is an unauthorised structure,” lamented Ms Subhashini. Mrs. Perera said they had no option but to set up the shop two years ago after her husband fell severely ill. “They keep telling us to move out but haven’t done anything to properly repair a single road,” she said. The mother and daughter live in Ihalagama, in the Gampaha MC. They still plan to vote. “To me, my vote is priceless and while I’m disappointed in politics I still believe in the electoral process. Hopefully, we can elect people who will genuinely work for the area,” Ms Subhashini added. Shopkeeper Chamath Colonne, 50, lamented that the state of some roads in his area make them virtually impassable. He wants to vote for someone who will look into such issues. “Parties should know to nominate clean candidates,” Mr. Colonne stressed, adding that irrespective of the party, people should vote for someone of good character who will work for the benefit of their area. For Champa Kumuduni, 38, a mother from Doranagoda in the Minuwangoda PS, scarcity of drinking water is still a major problem. “We suffered a lot during the drought. Water had to be distributed by bowsers. We don’t want that to happen again,” she said. Candidates, while agreeing that the district poses its own challenges, differ on priorities and how to resolve various issues. Eranga Senanayaka, the Sri Lanka Podujana Peramuna’s (SLPP) Mayoral candidate for Gampaha believes the poll would serve as a national referendum of the Yahapalanaya government’s conduct. He was certain of the SLPP’s chances as he claims the change people expected after the January 8, 2015 presidential election has proved to be an illusion. “Since independence, we have only lost the Gampaha MC twice. We will win this time too,” insisted UNP candidate Varuna Mahipala. Mr, Mahipala said the new administration had a responsibility to probe “numerous corrupt deeds” committed by the previous MC administration. M.A. Dayananda, 69, better known as “Gamini Mudalali”, has been an SLFP supporter for 45 years. Contesting for the Minuwangoda PS from the United People’s Freedom Alliance (UPFA), he said people had a right to expect local government authorities to deliver basic services. “They will be happy if their roads are repaired, lights are working and the garbage collected properly,” he said. In Mirigama, people live in difficult mountainous terrain and the road network needs urgent repairs, Sumanasiri Rajapakse from the Janatha Vimukthi Peramuna (JVP) stated. Mr Rajapaksa, contesting for the Mirigama PS, said there were drinking water shortages and that recently the roof of the only maternity clinic had collapsed. “We found out later that the authorities had repaired it, not with the funds of the PS but by collecting money from pregnant women who attended the clinic,” he revealed.